“It’s not the beginning of the end. We’re at the beginning of a fight – a long, drawn-out fight.” This is how Brazilian president Dilma Rousseff greeted Sunday’s vote to begin her impeachment. Despite a deep political and economic crisis, Brazilian stocks have rallied hard this year. But they don’t look cheap enough for the ongoing risks. Brazilian stocks are up a massive 37% year-to-date, measured in US dollars. That’s a big result, but I think they’ve got ahead of themselves. The MSCI Brazil index has a price-to-book (P/B) value of 1.4. That’s not especially cheap given all the risks, uncertainties and head winds that remain. On Sunday, the Brazilian Chamber of Deputies voted by 367 to 167 to begin impeachment proceedings against president Rousseff. A two thirds majority was needed, and comfortably reached. Now the vote passes to the Senate. With a simple majority it can vote to start an impeachment trial, which could last up to 180 days. In the meantime the president will be suspended and government could remain in limbo. 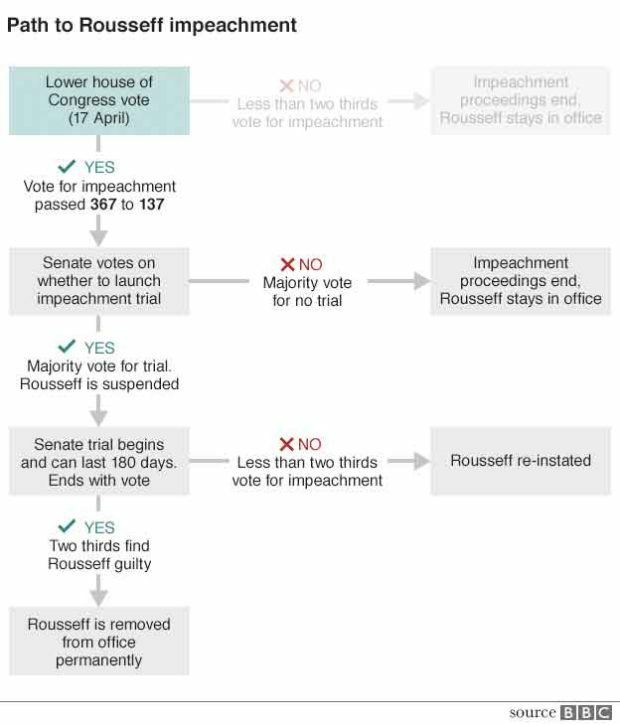 The process of removing a Brazilian president from office is laid out in the constitution. It’s a convoluted and complex legal process. But this hasn’t prevented Rousseff from describing it as an attempted “coup”. That’s a dangerous and loaded word to use in Latin America, with it’s history of military dictatorships and political upheavals. Brazil has been facing multiple crises in recent years. Perhaps most importantly the prices of practically all world commodities have collapsed. 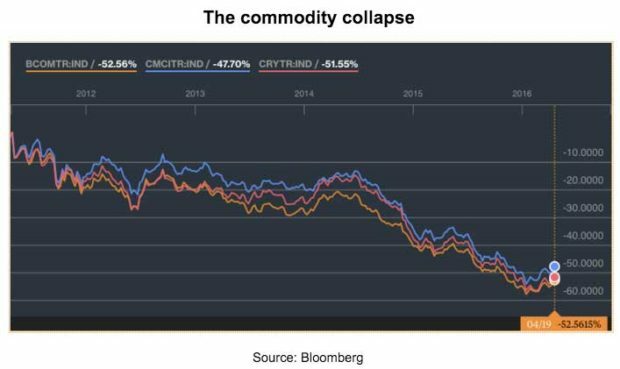 The following chart shows three major commodity indices over the past five years (Bloomberg commodity index, UBS Bloomberg CMCI, Reuters/Jefferies CRB). Each is down around 50%, with most of the fall happening since mid 2014. Brazil produces a lot of commodities for export – whether they are the kinds that are grown, mined or drilled. Weak commodities mean a weak economy for Brazil, as less money flows into the country. Last year saw a deep recession, with GDP shrinking around 6%. As the commodity tide has gone out, people have realised that Brazil was swimming naked. Or at least the swimsuit was particularly skimpy. Even on Rio de Janeiro’s Copacabana beach it would make the bathers blush. The local currency, the real, has lost about 40% against the US dollar since mid-2014. The government ran a massive budget deficit of 10% of GDP in 2015. Consumer price inflation is around 10% a year – well above most people’s comfort zone. The unemployment rate has risen back above 8%, a level last seen in 2009. To control inflation and the budget deficit the country needs higher interest rates and less government spending (or higher taxes). Both would be unpopular and put further pressure on the economy and employment. There are no easy fixes on the horizon. On top of this there has been a massive corruption scandal centered on the stated-owned oil company Petroleo Brasileiro (NYSE:PBR), known as Petrobras. This has become known as “operation car wash”. And I have to admit that when I first heard about it in 2014, my reaction was muted. Oil companies pay bribes? Politicians are corrupt? In Brazil? None of it sounded that surprising. But the sheer scale has turned out to be huge, involving many billions of dollars of overpayments for contracts, not just a few tens or hundreds of millions. Much of the money has flowed, ultimately, into political pockets. Plenty of people have already been arrested. Many more are under investigation. They include former president Luiz Inacio Lula da Silva (“Lula”) – Rousseff’s mentor – and another 47 current or former legislators. The entire political class is under close scrutiny. Petrobras itself has taken massive write-downs on assets that it turns out were overvalued. The share price has collapsed, wiping hundreds of billions of dollars from the company’s market capitalisation. Rousseff has actually come out fairly clean, so far. This is surprising, since she was the chair of Petrobras’s board between 2003 and 2010 when most of the illicit activity occurred. But none of the corruption has been directly linked to her. Yet. Despite winning re-election in October 2014, in a closely fought battle, Rousseff’s approval ratings have imploded as the corruption scandal has widened and the economy has collapsed. Of course, being unpopular isn’t grounds for impeachment. So what’s going on? Supposedly there was some creative accounting, using loans from banks to the treasury, that artificially boosted government balances in the run up to the elections. To be honest that sounds like a technical and relatively minor issue, given everything else that’s going on. But Rousseff’s opponents have seized the chance to get rid of her. But even if they succeed, then what? Most of the natural successors are also being investigated, so there could be a power vacuum for a long time. None of this is good for Brazil. The bottom line is that Rousseff isn’t going to go quietly. Accusations of an attempted coup will continue to fly about. Potential successors may not be able to step in, due to their own past misdemeanours. In the meantime, as this political theatre plays out, no one is doing anything to address Brazil’s woeful economy and finances. 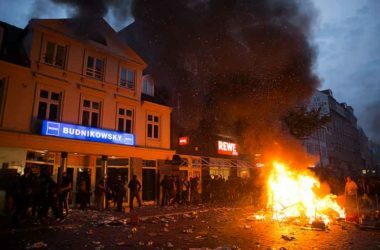 Further social unrest, mass protests and instability seem a certainty. A country that lacks decent schools, roads, railways, hospitals, – and just about every other kind of basic infrastructure you can think of – is about to showcase the US$11 billion or so that it has wasted on the construction of facilities for the Olympic games. Also Brazil is about to host the world’s biggest vanity project, in just a few month’s time. A country that lacks decent schools, roads, railways, hospitals, – and just about every other kind of basic infrastructure you can think of – is about to showcase the US$11 billion or so that it has wasted on the construction of facilities for the Olympic games. This is even more reason for angry Brazilians to take to the streets. And it will probably happen just as the impeachment trial is reaching its crescendo. Regular readers will know that the best investment opportunities are often found in countries that are going through difficult times. Stocks get too cheap, things improve, and investors willing to take the plunge reap outsized profits. I call it taking a “crisis vacation” with your investments (see here for more). But the key to that approach is to wait for the dust to settle, not to charge blindly into the cloud. Brazil still looks like it could kick up a lot more dust. I reckon a better bet at this point is Colombia. Last March I flagged it up as one to watch – even if I said it was still too early to buy. 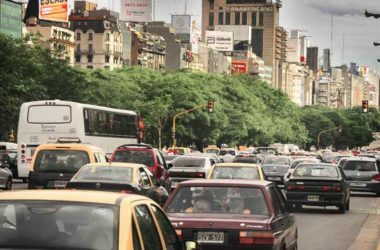 See “Collapsing Colombia could spell opportunity”. Colombian stocks are down 11% since then. Now it looks like it’s time to buy. 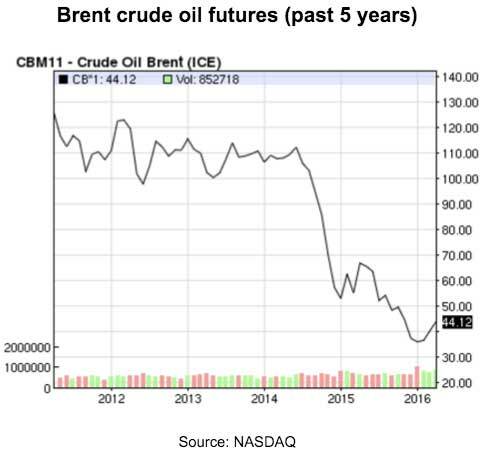 The worst of the oil price collapse has most likely passed. Things will probably get better, or at least be stable from here. An easy way to invest in Colombian stocks is via the Global X MSCI Colombia ETF (NYSE:GXG). Today the MSCI Colombia index has a P/B of 1.2. That’s well below Brazil’s, and minus the deep political crisis. 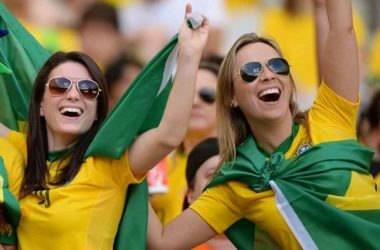 The time to invest in Brazil will come. 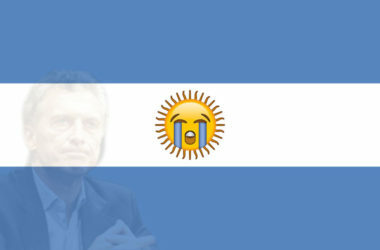 But for now, if you’re interested in Latin America, I suggest that you avoid Brazil and buy Colombia instead.